This is the very best conditioner available for vinyl and plastic surfaces and rubber trim. It leaves a soft, clean, cared-for look without oily film or silicone gloss. This is absolutely the only product we recommend for interior vinyl and plastic surfaces. Also, use it as a final finish on all surfaces when preparing your engine compartment for concours events. 8.5 oz. 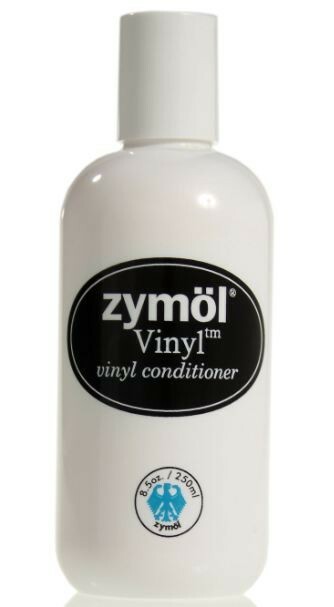 Vamp up your vinyl with Zymol Vinyl Conditioner! Vinyl has to be cleaned and protected regularly to avoid fading, cracking, peeling and UV damage. Just as ultraviolet rays are detrimental to our skin and cause premature aging, vinyl surfaces inside your vehicle suffer the same fate. Some vinyl manufacturing methods use formaldehyde or solvents as the base. However, this leaves an oily residue, fogs up the windshield with an oily film, and even causes nausea and headaches if inhaled. Zymol Vinyl Conditioner is a solvent-free, formaldehyde-free, oil-based feeding product that releases solvent and restores moisture in all vinyl and plastic components. Zymol Vinyl Conditioner is 100% safe to use and provides a surface that looks, feels and smells like new without leaving a greasy, slick shine. Zymol Vinyl uses natural lemon seed and sesame oils leaving a delightful lingering scent. Restore and revitalize vinyl surfaces with Zymol Vinyl Conditioner!